The POCLS is a representative longitudinal study of children and young people aged 0-17 years in out-of-home care (OOHC) for the first time in NSW on final Children’s Court orders. The study tracks the trajectories of each study child or young person over the life of the study. If the child or young person changes placement or returns to their birth family or is adopted during the study, the new carers or parents are invited to participate in future waves of the study. A new sub-study to track young people as they grow-up in the study, and transition to independence after they turn 18 years old, will commence in 2019. Participation in the study is voluntary. The following documents have information about the project phases and an overview of the study design. The population cohort is a census of all children and young people who entered OOHC for the first time in NSW between May 2010 and October 2011 (18 months) (n=4,126). 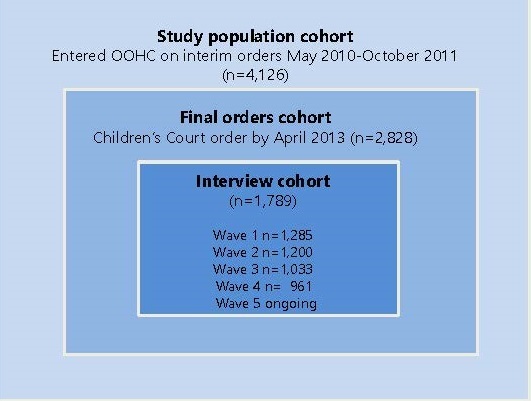 A subset of those children and young people who went on to receive final Children’s Court care and protection orders by April 2013 (2,828) were eligible to participate in the study (final orders cohort). FACS attempted to contact the caregiver of every child in the final orders cohort to inform them of the study and seek their permission to pass their contact details to the independent data collection agency – who in turn invite them to participate in an interview at each wave. Caregivers of 1,789 children agreed to be in the interview cohort. FACS researchers contacted every caregiver in the final orders cohort before Wave 1 to inform them of the study and seek their permission to securely transfer their contact details to an independent data collection agency that specialises in social research data collection.This is referred to as an 'opt-in' recruitment process. Caregivers of 1,789 children agreed to be in the interview cohort.The independent data collection agency invites every caregiver in the interview cohort to participate in an interview at each wave. Participation in the interviews is voluntary. FACS does not know the names of caregivers and children who complete an interview and all the interview data is de-identified by the data collection agency. Youth offending records (Bureau of Crime Statistics and Research). Face-to-face interviews collect information from children and young people from children aged 3-17 years, carers and parents. A wide range of information is collected in the interviews, including establishment of the placement, caregiver and household characteristics, child well-being and development, school and child care experiences, children’s relationships with the caregiving family and friends, parenting practices, services and support, birth family contact and neighbourhood. The study uses standardised measures and validated questions from other studies when possible, such as the Longitudinal Study of Australian Children (LSAC). Some qualitative data is collected to add richness to the quantitative data. NSW Health Blue Book was electronically scanned for children aged up to 5 years old at the first interview. The interview is repeated every 18-24 months. Abbreviated Temperament Scales adapted from the Revised Infant Temperament Questionnaire, the Toddler Temperament Questionnaire and the Childhood Temperament Questionnaire for children, School Aged Temperament Inventory (short form) for children 9 months-17 years. MacArthur-Bates Communicative Developmental Inventories (MCDI-III) for children 30-35 months old. Felt security activity(adapted from the Kvebaek Family Sculpture Technique) for children 7-17 years. The following figure shows how the wellbeing measures can be used for longitudinal analysis. Teachers (childcare and school) and caseworkers complete on-line surveys. These surveys are conducted once per child. Comparisons of the study population to the general population can be drawn using the standardised measures, record linkage data and general population studies including the Longitudinal Study of Australian Children (LSAC), the Longitudinal Study of Indigenous Children (LSIC), Towards New Indicators of Disadvantage, the Temperament Study and the NSW High School Health Survey. the Aboriginal Health and Medical Research Council of NSW Ethics Committee (approval number 766/10). NSW Department of Education and Communities State Education Research Approval Process (SERAP, approval number 2012260) and the Catholic Education Office Sydney (and relevant diocese) approval for the childcare worker and teacher surveys. NSW Population & Health Services Research Ethics Committee (Ref: HREC/14/CIPHS/74 Cancer Institute NSW: 2014/12/570) approval for record linkages.